The circumstances vary from film to film, but you know the drill. An epidemic or a government-created virus causes the dead to become “undead,” violent cannibals who wander aimlessly seeking only prey on living human beings. So why are Americans so obsessed with a theme almost as one-dimensional and single-minded as zombies themselves? The answer lies not in what zombies do, but what they represent. The concept of the zombie has existed in Caribbean folklore for centuries, and in the canonical literature of numerous cultures. Usually, black magic of some sort is responsible for reanimating the dead and forcing them to serve the miscreant or misguided purposes of the living. In Jewish folklore, the golem provides a similar example. In Frankenstein, Dr. Frankenstein creates a monster from the scraps of other dead human beings and in so doing gives birth to a creature that is sentient, outcast and capable of terrible vengeance. All of these examples highlight cases where the zombie menace is derived from the direct actions of human beings who—through ill-will, prideful arrogance or misguided curiosity—have upset the natural order; they have allowed mortal beings to drink from the cup of immortality and usurped the ultimate power of the divine to give and to take away the breath of life. Although zombie films appear sporadically throughout film history, the modern zombie film can be traced to George Romero’s “Dawn of the Dead,” a black and white late 60’s classic, a movie that used the zombie menace as an allegory for corrupt southern law enforcement, the suppression of civil rights and African American disenfranchisement. Although zombie films appeared sporadically since that time as part of a cult following, underground sub-genre of horror, the craze wasn’t really embraced by mainstream America until the last decade. Why is this so? In order to comprehend why Americans have come to fully appreciate the denizens of the undead, one must understand the components of a typical zombie film, and how they relate to the cultural context of American life. Most zombie movies display a remarkable degree of uniformity of conventions in terms of plot and presentation of zombie lore. Nearly always, the zombie is presented as a re-animated dead person who has no higher brain functions, but displays avolitional, apathetic behavior except in the presence of the living, when they violently attack and attempt to consume their flesh. 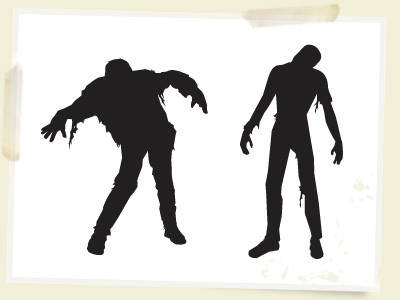 Usually, a bite or even a minor scratch is enough to initiate “zombie fever” in a living host, who then suffers from a high fever, convulsions and death, only to be reanimated hours or minutes after death in the hideous state noted above. Mobs of zombies often congregate together, staggering about aimlessly without any social contact until they mob together in ruthless attacks on the living. Ironically, although the higher-order functions of the brain have ceased, it is only by destroying the brain that a zombie can be stopped from their rampage. In these circumstances, zombie films are nearly always apocalyptic in nature, showing a break-down in the order of society, usually terminating in martial-law, desperate last-stands by the military, VIP’s or other hold-outs locked in bunkers attempting to stave off their demise. Zombie films often highlight the triumph or destruction of ordinary citizens who engage in a heroic struggle to both survive and understand their changed society. Often times, protagonists are presented with the difficult task of having to dispatch former friends and family members who have become converted into undead fiends. Zombie films also highlight how people with antisocial or undesirable qualities tend to survive because their paranoia, violent demeanor or sociopathic tendencies prove to be advantageous during the destruction of the social order. Tension between these anti-heroic characters and more family-oriented, selfless protagonists is a thematic focal point of the zombie film. These conflicts beg the question: does the human race deserve to survive, or are we already as inhuman as the beasts that prey on us? Unlike the archetypal forms presented in folklore, literature and in religious canon, in zombie films the cause of the zombie epidemic is often treated as unimportant, and is sometimes not addressed at all. In “28 weeks later,” and “The Crazies” and in the television series, “The Walking Dead” it is proposed that an out of control virus is the culprit. In the case of “The Crazies” the virus was designed and leaked by the U.S. military. In that scenario there is an aspect of science fiction conspiracy theory, as the military actively conspires against the populace it is sworn to protect. In other films, the military and police are presented as either useless and ineffectual, or as hostile forces that act only to save high-class VIP’s or themselves from the zombie menace, while letting ordinary citizens die. So why are zombies so popular now, even though they’ve been lingering in our mass-media consciousness for decades? What does the zombie myth mean, if the genesis of the undead is not directly traced to the actions of corrupt or wanton human beings? The answer is complex and multi-faceted. Like many post-modern societies, Americans have a fear of death and the harbingers of death: sickness, contamination, illness, mental decline and chaos. Zombies provide a tangible outlet for the expression of these fears that are palpable enough to feel real, while remaining fantastic enough that the masses can enjoy their mayhem at a distance without the anxiety experienced by an actual, plausible threat. The fear of death and illness is cross-cultural, universal and as old as the human race. So why did the zombie epidemic only just recently reach its apex in popularity and relevance to the American psyche? Zombie films also represent racial and class tensions in American society that are often unvoiced. The military-industrial complex is bankrolled by American taxpayers, yet their sophisticated weaponry is of no use in preventing chaos and anomie, and often their powerful weapons are turned on the very citizens who are attempting to escape the zombie menace. Ordinary Americans have a tradition of fear and mistrust of government and its institutions that are so deeply entrenched in our national character that they’ve written into our constitution, and these concerns are writ large in all modern apocalyptic films. As our history of racial and ethnic tensions illustrate, we clearly fear each other as well. But while fear of death, distrust of government and race and class are all expressed in zombie films, their ultimate relevance to modern Americans in the first decades of the 21st century concerns financial insecurity and a rejection of consumerist values. From the 1950’s -2000, the American middle class has been touted as the apex of the “American Dream” of home ownership, upward mobility, and the proof that application of the Protestant work ethic leads to wealth, status, and success. Many of these values were so effectively marketed, that Americans came to believe that they not only deserved a house, car and a vacation, but “everything” in terms of whatever modern miracles of changing technology could provide. By the turn of the 21st century, opportunities for growth of the middle class were in steady decline. The advent of the recession in 2007 and the Occupy Wallstreet movement in 2011 provided further confirmation that the possibility of achieving the aims of the American Dream was quickly becoming untenable, and Americans were no longer buying into its illusory promises. In this sense, zombies represent the ultimate materialist forces annihilating society with their insatiable, wanton greed. Film depictions of zombies show that even after they have the chance to feed on their victims, they never appear satisfied. Similarly, the worst criticism of American consumers is that no matter what they get, they feel they always need more. News coverage of mobs of people fighting each other to buy limited quantities of the latest trendy toy or gadget at Christmas time provides a starkly disturbing parallel to images of zombies mindlessly attacking their victims. Never the less, if the worst criticism that can be leveled against the American consumer is that they are greedy and “mindless” then what can be said of the corporate advertisers and social engineers who actively promote mindless consumerism to maximize their profits? Additionally, why do Americans feel compelled to spend so much time and energy engaged in television consumption, video game playing, and surfing the internet? Is it because these activities are stimulating, consciousness raising and bring people closer together? Or are these activities partially effective anesthetics against the ills of a sick and decaying society that dehumanizes and alienates people? Perhaps turning ourselves into metaphorical zombies is the most effective way Americans can cope with a degraded existence as powerless, urban-dwelling, expendable drones cut off from nature at the bottom of the corporate hierarchy. Perhaps it is not the American consumer, but American society itself that is the penultimate mindless zombie. If this is so, then zombies are not the expression of societal oblivion, but merely the victims of cultural forces that have degraded them to the point where their humanity is unrecognizable. Or, like the Occupy Wallstreet protesters, zombies are the harbingers of radical social change where the concept of necessity is redefined with more limited parameters than the “needs” of the post-modern American. In the post-zombie apocalypse, survivors band together and sort out their differences because they must. In this context, food and shelter, safety and security, and time are defined by the immediacy of experience—and this is a quality that urban, industrialized living lacks. Arbitrary schedules, foreign wars, biased journalism, traffic laws, celebrity gossip are all abstractions that cease to exist in the hedonistic expanse of the zombie film. Through this context, American audiences can vicariously experience what it feels like to rid themselves of these constraints and live in the present moment. This is not surprising at all, given the pessimistic observations made by Sigmund Freud. In Civilization and Its Discontents, Freud postulated that human nature had a dark side, thanatos: the destructive impulse or death instinct. He further outlined how the ultimate struggle of human existence is to balance the creative and destructive forces brewing within each one of us, and within our species. Sadly, the present moment that the zombie genre envisions us living in trades one set of inhuman circumstances as the balance of human nature tips us toward ultimate self-annihilation. This entry was posted in Essay, Friends and tagged american culture, analysis, culture, essay, friends, movies, pop culture, zombies. Bookmark the permalink.